So, I have always been a die hard hardtail mountain bike fan. I just didn't like full suspension bikes for so many reasons, and aside from that, I never really thought that dual suspension bikes rode that well. They certainly weren't more efficient climbers, and they didn't seem much faster on the downhill sections either. Test rides on full squishers always let me down. I wouldn't even consider a 26" dualie, and all the 29er dualies felt like barges moving down the trail, incapable of taking tight turns, or last second line changes. So, I was always a die hard hardtail fan; then I rode the new Jamis Dakar XCT 650 Comp, and everything changed. I am not opposed to trying new things, even when I am really skeptical; it has lead me to some great new bikes. The Dakar XCT 650 Comp is one of those bikes I wasn't really sure I would like. The $2400 price tag was immediately attractive. For a nicely spec'd dualie with 650B wheels, it is very appealing and doable. 5" of travel front and rear also sounded really nice. Then, I was impressed by the fact that even at this price point, the bike had front and rear thru-axles. Asymmetrical chainstays? Check. Tapered headtube? Check. Hydraulic brakes? Check. Surefire Shimano Deore 2x10 drivetrain? Check. With all these bases covered, it was worth considering adding this bike to my quiver. Then came the test ride. We had a spot of beautiful weather many Sundays ago, and I got to test ride one of these XCT 650 Comp's on some local trails. The first thing I noticed was the near bottomless travel; it felt like I never bottom the shock out. I could put all my weight into the saddle and just ride along trusting the bike to do most of the work. The second thing I noticed was that, even in fully open setting on the X Fusion rear shock, this bike climbed really well. I was getting great rear wheel contact, and climbing at a much faster pace than I imagined possible on a 30lb soft-tail. With the rebound setting on the rear shock set to the fastest position, I was climbing quickly and efficiently, and not noticing any pedal bob, even in the full open setting. When I slowed down the rebound speed, the rear suspension changed dramatically. It felt even more plush, and I seemed to be going through more of the available travel. The high speed rebound setting is definitely better for climbing. The low speed rebound would be great on a longer, semi-smooth descent. I encourage anyone who test rides this rig to play with the rebound setting a lot before settling into one particular setting. Try every possible setting; it makes a huge difference. I also think that terrain and trail-type will determine my rebound setting more than personal preference. The rear shock also has a lock setting, for climbing. I did not use it much; but it works. It works so well, in fact, that I didn't like it. I was just getting used to 5" of plush travel, and then you flip that switch and all of a sudden, your dualie feels just like a hardtail! It was night and day between the two settings. The headtube angle on the 2014 XCT felt more dialed in than previous year models, too. Both years list 69deg headtube and 73deg seat tube angles, but it felt like the 2014 model had much better steering and handling than last year's model; less of a flip-flop feel. I won't go in any great detail about the wheel size. 650 wheels have proven themselves, their adoption by nearly every major bicycle brand is evidence that they have advantages over the other two wheel sizes; no need to beat a dead horse. Much to my delight, this test ride was shaping up to be quite a treat! So I pushed on; the XCT 650 Comp was doing everything and doing it very well. As I carved through switchbacks, and pedaled furiously through my favorite singletrack, pushing this bike to find its weaknesses, I began to wonder if this bike would get more riding time this season than all my favorite hardtails. Log crossings became ramps to ricochet off of at full speed. Rooty, rocky sections were attacked with vigor at full speed to test the suspension; no problems there. I began searching for gnarlier lines to see what my limits were on this bike, but I think I'll have to go to Rothrock to really push this bike to its limits, and I was only at Scotia Range. Even the 30lb bike weight wasn't bothering me; in fact, I think the heavier bike felt great through the techy, rough stuff. It was easy to hold my line, and maneuver as necessary, as the bike just seemed to want to keep moving forward. I had a great day of riding, and I cannot believe how much I have come to appreciate the benefits and nuances of full-suspension mountain biking. Sizes: 15", 17", 19", 21"
See Jamis Suspension Tech in great detail. Although I won't go in great detail, I was just as excited to try out the component spec on this bike as well; a full Shimano Deore 2x10 drivetrain. Deore is back, and better than ever. I was thoroughly impressed with the shifting. Chain never dropped, or missed a gear. Shifting is crisp, and snappy. I have since upgraded the rear Deore mech with a Deore Shadow Plus. The Shadow plus feature is available at the Deore level now; bonus. The Shimano brakes aren't Deore level, but they did not disappoint at all; the don't have that snappy level feel the Deore and better brakes have, but they did not leave me wanting more stopping power, and modulation was very good. All things considered, this bike has exceeded my expectations. 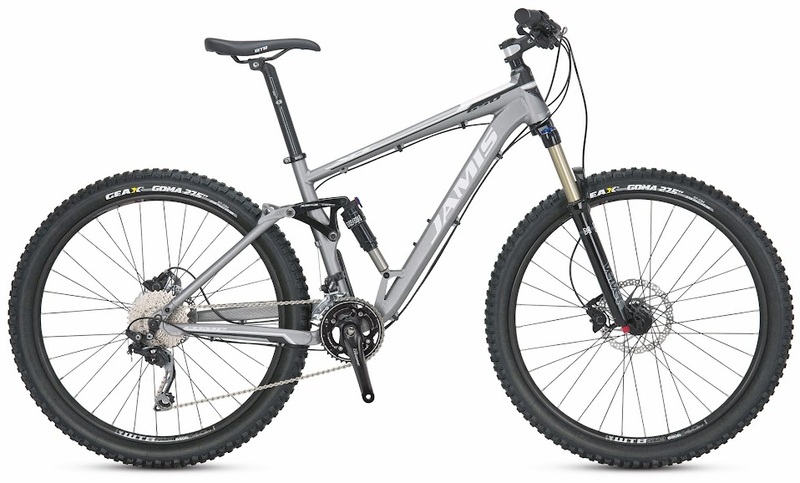 Its price point, frame features, wheel size and outstanding parts spec make this bike a valid choice for any mountain biker. You will love climbing on this bike just as much as descending. The 5 years of R&D Jamis invested in this model is clearly shining through. Stop by our shop and test ride one today. We even have a demo model you can take to the trails.